Just a month ago, we released new tool, the ever-expanding Content Library, which helps educators to build training courses faster and more efficiently. Today, we’re introducing the first update of the Content Library for eLearning authoring. Let’s have a look which new content items have appeared and how they can help you with your eLearning content development. New course template. This energetic course template with a darker background and vibrant color accents boasts extremely clear navigation options. Plus, it includes 9 new slide layouts. 30 iSpring Suite backgrounds and 24 iSpring TalkMaster backgrounds. We’ve added images of classrooms, university campuses, libraries and lecture halls. And if you create health and safety training courses, images of roads under construction and maintenance are now available. How does iSpring Content Library work? 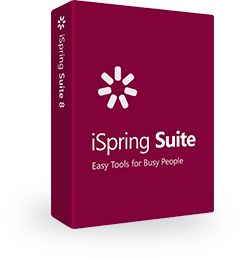 The iSpring Content Library is a collection of assets that comes with iSpring Suite for fast eLearning authoring. It combines all the content essentials a course creator may need: cutout characters, backgrounds, slide and course templates, images of gadgets and office supplies, navigation elements, and icons. You can easily build a course with these ready-to-use eLearning templates and content items, and be sure that your training materials look professional and cohesive in design. You can check out a demo course made with iSpring Content Library assets below. It’s a communication skills training course for a car dealership. At the end of the course, learners are welcome to practice their newly-obtained techniques with a dialogue simulation. With the iSpring Content Library, all the necessary learning stuff (characters, icons, buttons, and backgrounds) is always at your fingertips, right in your PowerPoint. You don’t have to devise a course structure from scratch, or bring a professional designer on board: you can simply select one of the ready-to-go iSpring templates, type your texts, and add images or media. The wide range of characters, templates and locations lets you stage various learning or real-life scenes; for example, on-site training for construction workers, shop attendants, or nurses. The iSpring Content Library is available by subscription. All iSpring Suite users can access a basic set of characters, backgrounds, templates, and objects for free. iSpring constantly researches the newest e-Learning content development trends and integrates them into our products right away. We’re going to continue releasing Content Library updates every 1-2 months. We always listen to our customers’ comments and concerns, and would love to hear which characters or objects you’d like to see in one of the next releases. Please email us at customer.care@ispringsolutions.com, or call +1 800 640 0868.